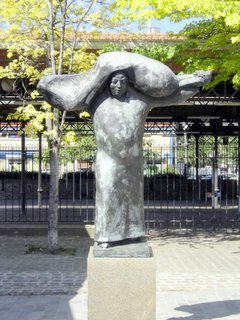 Long ago, the area surrounding Parc Georges Brassens was known as the hamlet Vaugirard. In 1342, it was recognized as a parish. In the 18th century, the large vineyard of Périchot, also known as Morillons, employed most of the inhabitants of the area. During the 19th century, the vineyard gradually disappeared and was replaced with market gardens. On December 31, 1859, the hamlet of Vaugirard was incoprorated by Baron Haussmann into the City of Paris. In 1894, the slaughter-houses of Vaugirard were constructed. The kinds of animals butchered here were cows, goats, pigs, fowl, sheep and in 1904, horses were added to the list. The slaughter-houses were very busy for many years, but eventually, they became out-dated. Between 1974-1975, the slaughter-houses were destroyed. It is on this site of the Vaugirard slaughter-houses where the 7.3 hectare Parc Georges Brassens was created, designed by Alexandre Ghiulamila, Jean-Michel Milliex and Daniel Colin. 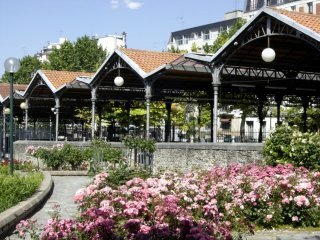 Parc Georges Brassens opened to the public in 1984 though it was given its name on November 26, 1982 by the Mayor of Paris, Jacques Chirac. Georges Brassens (October 22, 1921-October 30, 1981) was a French singer-songwriter-poet. He was born in Sète, near Montpellier, and is buried there as well. He lived in the neighborhood of the park at 42 rue Santos Dumont from 1968-1981. 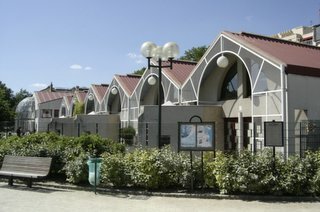 Parc Georges Brassens has retained several elements of the slaughter-houses. 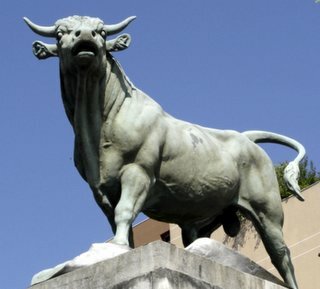 At the main entrance to the park on rue Morillons are two pillars bearing the statues of two large bulls. These are the work of the animal sculptor Auguste Nicolas Caïn (1822-1894) and were created in 1878. 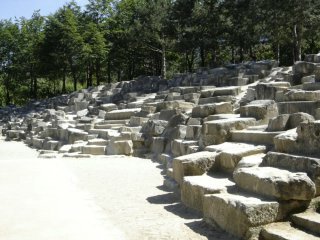 Originally, they were placed in the Trocadéro Garden. The two buildings at the main entrance are also from the time of the slaughter-houses and have been restored. One of the buildings is used by the park services. The other is an activities center used mainly by a senior citizen's club. The clock tower and belfry is now surrounded by a large pond which holds 750 cubic meters of water and has a fountain that shoots water 25 meters into the air. On rue Brancion the metal roofed horse market was constructed in 1907. This is where the horses were bought that were going to be slaughtered. The horse market pavilion is now the site of a week-end second-hand book sale. From 9 a.m.-6 p.m. on Saturday and Sunday, sixty-eighty booksellers set up their collection of old books for sale. Each year over 200 booksellers participate. The book-sale is organized by G.I.P.P.E., the Groupment d'Information Promotion Presse Edition, the Group of Information Promotion Presses Edition. On the north-east corner of the park on rue Brancion is the metal-roofed, pyramid shaped building of the Theatre Silvia Montfort built in 1986 and designed by architect Claude Parent. 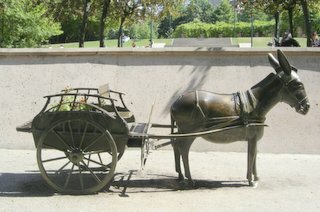 On the street, in front of the theatre stands a monument dedicated to the memory of those who were killed in the horse-killing industry during 1914-1918. The names of the men killed during this time are inscribed on a tall, rectangular stone wall. The names of the horses are not. Also on this memorial is a bust of Dr. Emile Decroix, the man who began the horse-killing industry here at the Vaugirard slaughter-houses. 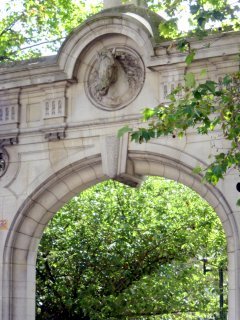 Speaking of horses, on the south-east corner of the park is an arched entryway which features the sculpted head of a horse at the top. 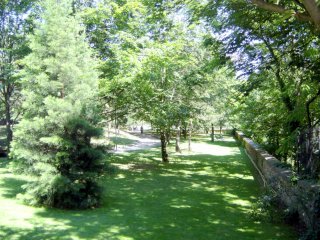 The terrain of Parc Georges Brassens is on the gradual slope of a hill and the park grounds undulate with several small knolls. There are many trails that wander around these small knolls leading to a variety of differently designed sitting areas. One of these knolls is actually a small hill and offers a panoramic view of the immediate area. On the north end of the park is a deep ravine with a creek running through it. The slopes of the ravine are thickly covered with plant-life giving the impression of being in a forest somewhere far from the city. Lawns cover the ups and downs of this park. Groupings of tall trees are scattered throughout the park as are beautifully planted flower-beds. 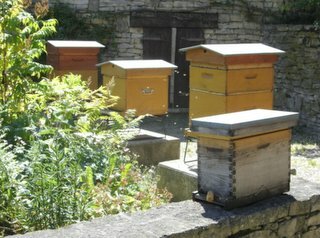 A bee-hive is found here in Parc Georges Brassens. It is managed by the Central Company of Bee-Keeping. It was created in 1986. Since then it has been visited by more than 30,000 children who are taught about bees and pollination. On the first Saturday of October a sale of honey produced at this bee-hive takes place. A terraced vineyard of 1,200 square meters and 700 pinot noir grape vines is located near the beehive. This vineyard is a reminder of the vineyards of Périchot which once covered the area. 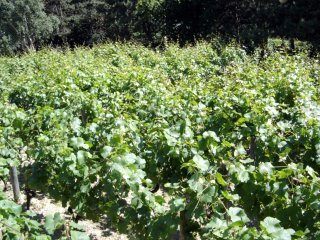 The vineyard is harvested every year by children and produces 320 bottles of wine called "Clos des Morillons" under the control of bistro operator Jacques Melac. The Rose Garden in Parc Geroges Brassens contains 510 rose bushes of 27 different varieties. A Garden of Scents, a Jardin des Senteurs, covers 1,300 meters of the park. 80 different kinds of aromatic plants, spice and medicinal plants are all designated with signs in Braille as this Garden was specifically created for the visually impaired. 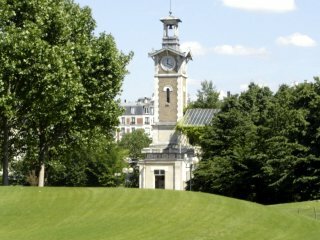 The plants growing in Parc Georges Brassens include 243 conifers, 442 trees, 11,000 shrubs and bushes, 6,500 hardy plants, 2,620 water-bordering plants, 242 flowering plants and 33,740 square meters of lawn. An elementary school and a nursery school border Parc Georges Brassens on the north side. These schools were designed to blend with the architectural style of the remaining buildings of the slaughter-house. Included in Parc Georges Brassens is a vegetable garden, a carousel, playgrounds for children, ping-pong tables, a gazebo for musical concerts, a climbing area made from the stone blocks of the former buildings, a bust of Georges Brassens made by André Greck, a sculpture of a man carrying a butchered portion of an animal and a puppet theatre called Theatre du Polichinelle which offers performances on Wednesday at 3:00, 4:00 and 5:00 p.m. and on Saturday and Sunday at 3:30; 4:30 and 5:30 p.m. with a 3 euros admission fee. The park is wheel-chair and baby stroller accessible as there are ramps throughout the park. 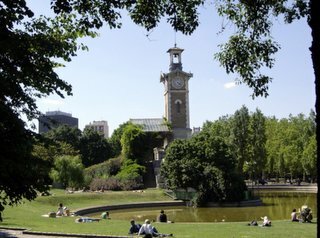 Parc Georges Brassens is open everyday at 9:00 a.m. The closing hour varies with the season. During January it closes at 5:30 p.m.; during February at 6 p.m.; during March at 7 p.m.; during April 15-May 15 at 9 p.m.; during May 16-August 31 at 9:30 p.m.; during September at 8:30 p.m.; during October at 8 p.m.; during November 1-15 at 6 p.m.; during November 16-December 31 at 5:30 p.m.